The Fourth Annual Zócalo Public Square Book Prize is made possible by the generous support of the California Community Foundation. 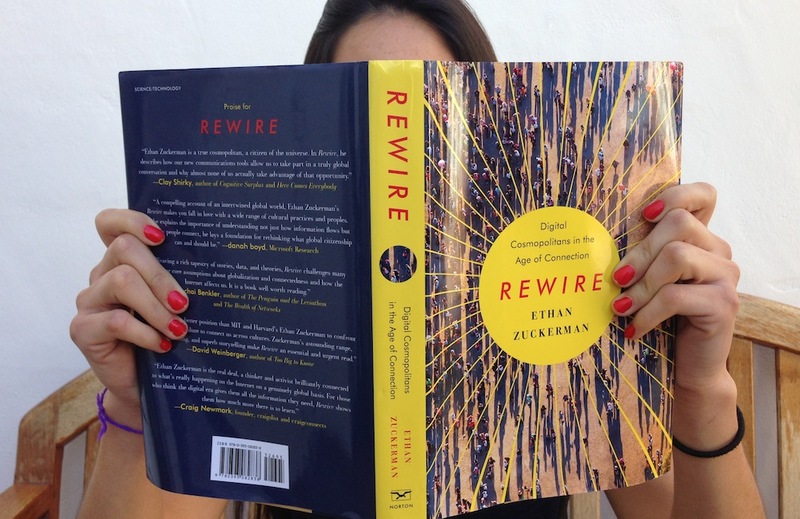 We’re delighted to award the fourth annual Zócalo Book Prize to Ethan Zuckerman for Rewire: Digital Cosmopolitans in the Age of Connection. In the view of our distinguished panel of judges, Zuckerman wrote 2013’s most illuminating and compelling nonfiction book about community and human connectedness. The Zócalo Book Prize comes from an integral part of our mission: to talk and think about how diverse societies cohere. In the past 11 years, we haven’t come up with all the answers—but we’ve done what we can to encourage scholars, writers, and thinkers to keep considering the question. In Rewire, Ethan Zuckerman challenges our assumption that the Internet will inevitably create a more connected world. Since the Victorian era, utopians have believed that technology has the power to erase prejudice, enhance cooperation, and create a new global social order. Despite the ubiquity and power of the Internet, none of this has come to pass. Zuckerman shows how the Internet reinforces the human tendency to interact with those with whom we have the most in common. At the same time, he offers optimism about the many ways in which technology can do a better job of bringing people of diverse backgrounds and interests together. He knows this subject firsthand. Zuckerman is the director of the MIT Center for Civic Media and co-founder of Global Voices, an international community of bloggers working to make online political dialogues more globally inclusive. As the winner of the Zócalo Book Prize, Zuckerman will receive $5,000—and on Friday, May 9, he’ll deliver a lecture: “Can the Internet Be Rewired to Build a Smaller, More Cooperative World?” at MOCA Grand Avenue. Please see more details on the award ceremony, sponsored by the California Community Foundation, here. Q. What’s the biggest force against our becoming citizens of the universe—and connecting with people around the globe—in contemporary life? A. Unfortunately, it’s a 25-cent, sociological word: “homophily,” which explains the tendency of birds of a feather to flock together. If you are a liberal from New England and you go to a place where there are people from all sorts of backgrounds, you are naturally going to find the liberals from New England. There are piles of sociological literature that show that people will walk into a computer lab at a college and gravitate toward people they have something in common with. Homophily combines with the Internet and has made it really, really easy to find our tribes online and to get as much information as we can from our tribes. The temptation is to blame the Internet—Facebook is isolating all of us, it’s separating us into echo chambers. Some of this is true, but it’s the combination of this very basic tendency for us to sort ourselves by race, ethnicity, gender, political beliefs, and socioeconomic status, combined with the incredible amount of choice we have online. Q. You challenge cyberutopianism but don’t dismiss it out of hand. How would you respond to criticism that your arguments are too moderate to effect real change? A. The cheesy way to write a trade book is to take a sharp stab in one direction and assume someone else is going to write something counterbalancing you. It’s easier to write a book saying the Internet is stupid or the Internet is giving us superpowers than it is to write a book that says the Internet is complicated. I think there’s a case to be made that this is the best tool for international understanding. There’s also a case to be made that we’re really far from using the Internet in that way. The problem is that makes it a whole lot harder to sum up the argument. Q. Can you recommend three simple steps anyone can follow to transform oneself into what you call a “bridge figure”—a person who connects cultures? 2. When people start looking for international news or news from other places, they dive into something like Global Voices and read everything on the site, and it’s really, really hard. When you start learning about a different world, you have to pick up a certain amount of background. My friend, [technology writer] Clay Shirky, has a good suggestion: pick one part of the world you want to know more about. 3. Find a way into other parts of the world through what you already know and what you care about. I’m a music guy. I spend a lot of time looking for music from around the world. There are countries where all I really know is what the music there sounds like. But even that is enough context that I’m more receptive to what’s going on in those countries—I’m more open to them. Q. How can folks who want to build a more connected society use the upcoming World Cup to our advantage? A. I think the World Cup is a great time to look at this. For starters, the World Cup is a terrific way to take a look at Brazil and to look at Brazil’s mixed feelings about the Cup. People who are passionate soccer fans and passionate about Brazil’s rise are also deeply skeptical about whether they should be spending this much money on a soccer stadium. It’s also a wonderful time to dive into each of the nations who end up competing: their challenges, their futures, their histories. During the 2010 World Cup, Global Voices set up watching parties online for people from each country who were involved with the matches. We expected them to be full of taunting and a little stressful. Instead, it was wonderful. It was so polite. It started with each side complimenting the other and asking who on the other team was famous, who was well-known, who was loved as a player. We expected a bar fight, and it turned into a wonderful conversation between groups. I see the World Cup and the Olympics as wonderful excuses to explore our curiosity and find out about other parts of the world.